We have a number of solutions from a simple standard system with only one mixer to more advanced systems and multiphase systems with several mixers and feeding tanks. Take a walk into a SKIOLD solution with residue feeding, just click here. Looking for dry feeding solutions? SKIOLD supplies a complete program of mixing tanks with capacities ranging from 1500-8000 liters. The mixing tanks are equipped with a drain which helps to reduce remaining quantities, as well as a cleaning door with a mounted magnet to remove any metallic foreign bodies. Rest-tanks can be integrated with the main mixing tank for storage of remaining quantities. Furthermore, they will be an incorporated part of the pipe cleaning system, in which old recipes are being "pushed" out by new ones. Both the rest-tanks and mixing tanks are equipped with an automatic cleaning system. A safety device is placed on top of the tank to prevent accidents. The tanks have been designed with focus on longevity and fast and easy cleaning. Installations are equipped with tested pumps with high performance and operational reliability. Centrifugal pumps in stainless steel and supplied with 4.0 or 5.5 kW motors. SKIOLD is very focused on energy consumption and maintenance costs. SKIOLD offers a complete program of feed valves which among others consists of feed valves, section valves and ball valves. The ball valves are used especially in challenging conditions, where feed needs to be pumped over long distances. The new DM5 feed valve has been developed to withstand the future demands of secure and easy operation. 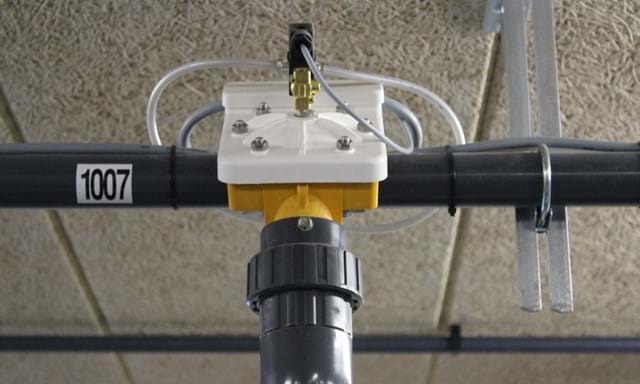 The valve is equipped with a stainless rough-boring angle and stainless bolts, which makes it easy to mount. The rubber membrane is made out of 2 layers of rubber, which are vulcanized around a heavy fibre net. This ensures a powerful membrane with an optimal life span. Liquid grinding is actually the only way to handle wet corn. The intake/grinding of the wet corn is handled by a liquid feeding system, DM6000. The corn is dosed via a gas-proof silo into the grinding chamber through a magnet trap. Fluid has been added into the liquid feed tank prior to the grinding. The fluid helps the corn through the grinding in the mill and prevents material build-ups. The system is self-cleaning, and when the grinding is completed, the system is cleaned internally with clean water. Thereby, feed remains and condensation problems are avoided. The result is excellent feed hygiene which strenghtens the general health. Limited wearing and no water water spillage are also key advantages in terms of reducing feed costs. The system of norms is understood as the traditional way in which a liquid feeding is installed. The feed remains in the pipe between feedings. In this type of system, the feeding computer can calculate the quantity of the individual components resting both in the mixing tank and in all parts of the pipe system. Thus the system is capable of compensating the various recipes. Depending on the present conditions under which mixing can take place, an optimal feed-mix will be reached. SKIOLD's feeding computer will always inform you exactly what is being fed and by itself adjust for changes in feed-value and contents of liquid. This principle is an extension of the standard system, but typically consists of two mixing tanks, each holding a recipe. The first recipe is distributed from one mixing tank, and then the contents of the circuit is exchanged with the recipe from the other mixing tank. The feed of the first recipe is now pushed back into the mixing tank, which has just distributed. This type of system is typically used for finishers, where there is a change of recipe in the middle of the growth period. Basically the system consists of mixing tank (liquid feed mixer) and a liquid tank. The liquid tank mixes the amount of liquid, which is needed for the feeding. This amount of liquid is afterwards being pumped through the feed circuit and back to the mixing tank (liquid feed mixer). When the feed distribution is starting, the feed from the mixing tank is pushed into the feed circuit, and the liquid inside the circuit is returning to the liquid tank. When the mixing tank runs empty, the system changes over and starts pumping from the liquid tank, and the distribution of feed continues for as long as feed is left inside the circuit. In this way, only liquid is left inside the feed circuit. Residue free liquid feeding ensures that only freshly made feed is distributed, resulting in a better feed consumption. These are all functions that have proven to be useful tools for a successful implementation of the ad-lib system. The basic principle in a phase-feeding system is that two separate mixing tanks individually make up a recipe with a high respectively low content of protein. From each mixing tank a separate circuit is leading to the stable(s). 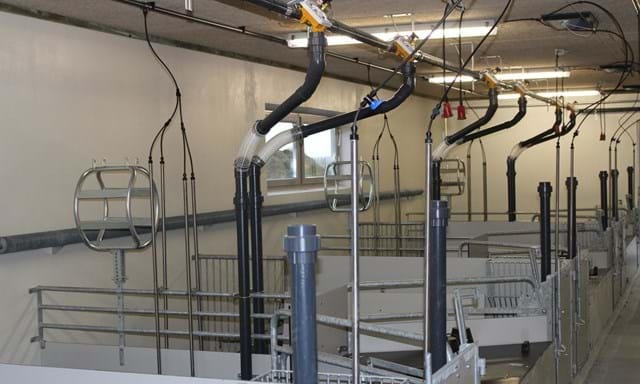 The pipes run parallelly over the pens, and through a feed-valve from each pipe these are connected to the drop pipe of each pen. As the two valves open simultaneously it is possible to mix the exact blend of protein, which is adjusted to the growth-phase of the pig. Next to profitability in feed consumption you will experience a considerable reduction in phosphorus and nitrogen of the manure.